Please folks; while there are many different ways to write this form of poetry, to avoid confusion, for this meme we are ONLY using the 5-7-5 rule for our haiku. Thanks! Have a happy Christmas, and thanks for running your haiku challenges! Jenn…Your Haikus are always so insightful. I had a couple of ‘spirit’ haiku lying around – the first was Halloween-themed, but the second is more appropriate for current season. Hi, I’m new here, but I follow the G-Man, and I’ve written some haiku–they are spirited, though perhaps not about spirit! Oh well. Thanks for hte opportunity. Excellent Jenn. Loved the ‘fat’ elf man one especially. Bravo! 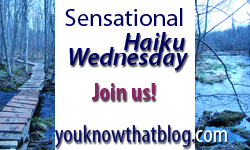 A wonderful prompt and a lovely set of haiku you created. Happy Holidays, hope the holiday spirit touches your soul and you can feel it (I read your essay entry). Many blessings to you and your loved ones.